The Eternal Question: How Much Do These Apricots Weigh? Quick announcement: Have you enjoyed the puzzles in this column? If so, I’m pleased to tell you that we’ve collected many of the best, along with some that have never been seen before, in a real live book! It’s called “The Riddler,” and it will be released in October — just in time for loads of great holidays. It’s a physical testament to the mathematical collaboration that you, Riddler Nation, have helped build here, which in my estimation is the best of its kind. So I hope you’ll check out the book, devour the puzzles anew, and keep adding to our nation by sharing the book with loved ones. And now, to this week’s puzzles! You loaded a drying shed containing 1,000 kilograms of apricots. They were 99 percent water. After a day in the shed, they are now 98 percent water. How much do the apricots weigh now? I flip a coin. If it’s heads, I’ve won the game. If it’s tails, then I have to flip again, now needing to get two heads in a row to win. If, on my second toss, I get another tails instead of a heads, then I now need three heads in a row to win. If, instead, I get a heads on my second toss (having flipped a tails on the first toss) then I still need to get a second heads to have two heads in a row and win, but if my next toss is a tails (having thus tossed tails-heads-tails), I now need to flip three heads in a row to win, and so on. The more tails you’ve tossed, the more heads in a row you’ll need to win this game. I may flip a potentially infinite number of times, always needing to flip a series of N heads in a row to win, where N is T + 1 and T is the number of cumulative tails tossed. I win when I flip the required number of heads in a row. Congratulations to 👏 Stephen Cappella 👏 of Castle Rock, Colorado, winner of last week’s Riddler Express! Last week brought us to Riddler Laboratories, where you wanted to spin some samples in a centrifuge. To run safely, the centrifuge needed to be perfectly balanced along every axis; otherwise, the torque would damage the internal rotor. If a centrifuge has N equally spaced buckets, some of which you’d like to fill with K samples, and all samples are of equal weight, for what values of K can all the samples be spun in the centrifuge safely? 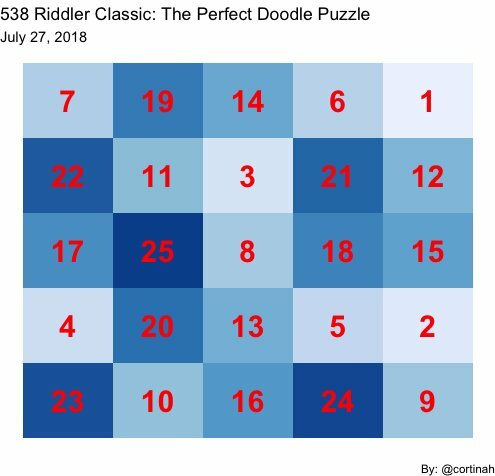 It turns out that we need to know some things about prime numbers to work safely in Riddler Lab. Specifically, as our winner Stephen explained, we can balance K samples in N buckets if and only if both K and N – K are expressible as the sum of prime factors of N.
For example, we can safely run seven samples (K = 7) in a 12-bucket centrifuge (N = 12). In this case, N has the prime factors 2 and 3, and we can add 2 + 2 + 3 = 7 to get to K, and 2 + 3 = 5 to get to N – K. We cannot, however, safely run 10 samples (K = 10) in a 21-bucket centrifuge (N = 21). In this case, N has the prime factors 3 and 7, and there is no way to add copies of these to get to N – K, i.e., 11. Why does this formulation based on prime factors work? Solver Gavin Stewart explained it by talking about how you place the samples in the centrifuge. If one arrangement works (say, four samples) and another arrangement works (say, three samples), then an arrangement that combines those two others (four and three, say) will also work. Indeed, my unscientific survey of Amazon revealed many centrifuges with spaces for 12 samples. This problem has also been the subject of some academic study, and you can find a further mathematical discussion of the solution in this 2010 paper. Congratulations to 👏 Adam Ghozeil 👏 of Corvallis, Oregon, winner of last week’s Riddler Classic! Last week, we introduced the perfect puzzle for doodling during a boring class or meeting. Start with an empty 5-by-5 grid of squares, and choose any square you want as your starting square. The rules for moving through the grid from there are strict: 1) You may move exactly three cells horizontally or vertically, or you may move exactly two cells diagonally; 2) you are not allowed to visit any cell you already visited; and 3) you are not allowed to step outside the grid. You win if you are able to visit all 25 cells. Is it possible to win? If so, how? If not, what are the largest and smallest numbers of squares you can legally visit? Yes! It is possible to win. In fact, there are 12,400 ways to do so.